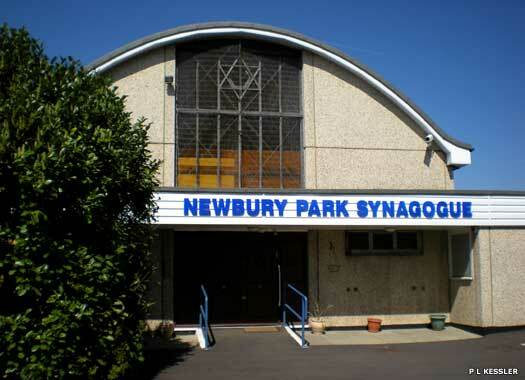 Newbury Park Synagogue is on secure ground at 23 Wessex Close, at the far end of the close and safely behind a tall green steel fence. It is a constituent of the United Synagogue, which is an Orthodox organisation of London Jews that was founded with the sanction of an Act of Parliament, in 1870. By 2007 it was the largest religious grouping within the British Jewish community and also in Europe, covering sixty-two Orthodox Jewish communities. The Catholic Church of St Theresa is accessed via Brook Road, and overlooks Eastern Avenue, as seen here. 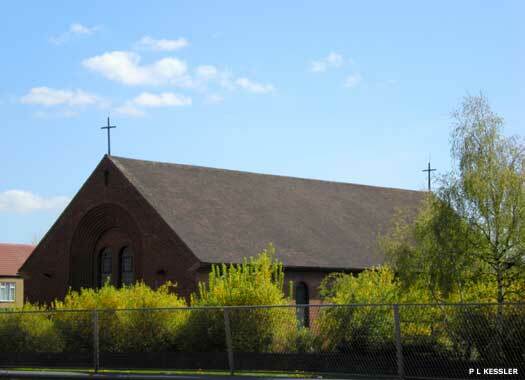 The church is a plain rectangular building of red brick which was opened in 1952. It was here that the noted Catholic priest, Father Gordon Read, who was born in Westcliff-on-Sea on 8 October 1948, was appointed by Bishop Casey to serve his diaconal year in 1975, before being ordained into the priesthood at Our Lady of Lourdes, Leigh-on-Sea in 1976. Oaks Lane Methodist Church is on the eastern side of Oaks Lane. Methodists started in the area with Seven Kings (Primitive) Methodist Church on nearby Meads Lane in 1904 (location unknown). It closed about 1934, along with Newbury Park (Wesleyan) Methodist Church on Perryman's Farm Road, after the union of Methodist branches. Both sets of members joined together on Oaks Lane, opened in 1934. This closed about 2008-2009 and is now a Hindu centre. The South-West Essex & Settlement Reform Synagogue is also on Oaks Lane, immediately behind the Methodist church. It was founded in 1956, and the plain hall shown here opened on 15 November 1964. Nothing can be seen of the synagogue itself, a circular building behind and to the right of the hall. 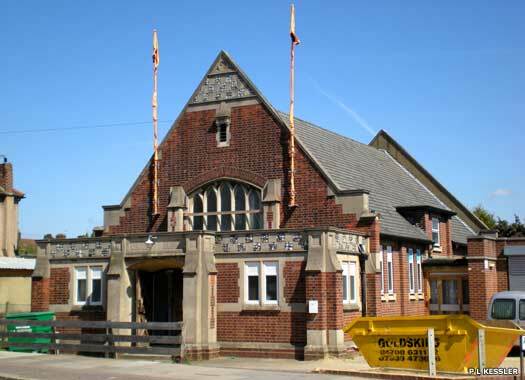 On 11 May 1997 the Settlement Synagogue merged with the SW Essex group. 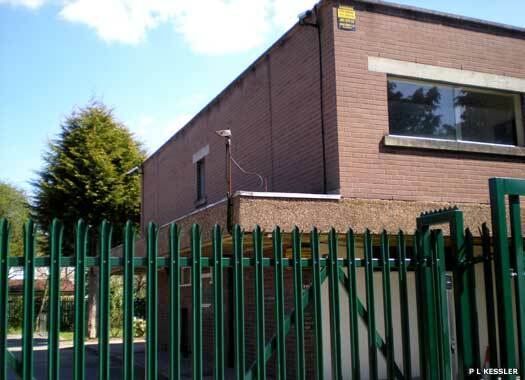 There was also a Salvation Army Citadel, Oaks Lane, but no trace of it could be found in 2010. 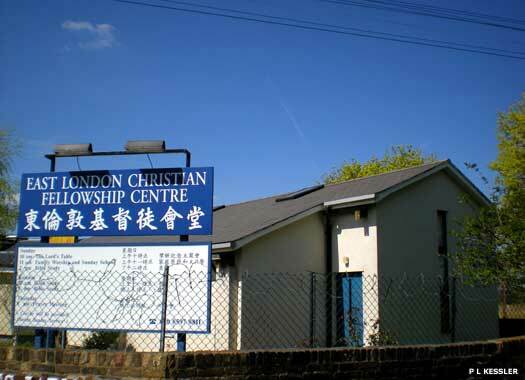 East London Christian Fellowship Centre is on the western side of Oaks Lane, at Whites Farm, next to Oaks Park High School. The centre has one vaguely interesting window at the front, but the rest of it could be any type of utility building, and is very uninspiring. The fellowship has a large Chinese membership in this evangelical Christian church, and Sunday services are conducted in English and Chinese (Cantonese and Mandarin). Old Chapel Aldborough Hatch lies alongside Aldborough Hatch Farm, on the footpath between Aldborough Road North and Oaks Lane. About 1728, Colonel Martin Bladen built Aldborough House, a large mansion fronting Oaks Lane. 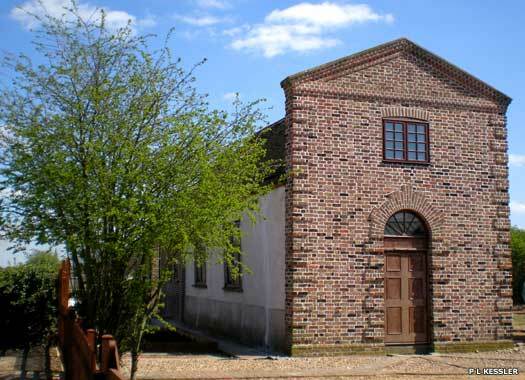 Attached to the mansion was this chapel which could have been of an earlier date and was possibly the meeting place of a Presbyterian congregation recorded at Aldborough Hatch in the second half of the seventeenth century. Until the first half of the nineteenth century, Hainault Forest came down to Aldborough Hatch and 'Hatch' itself denoted a hatch or gate into the forestland. In 1851 Hainault was 'disafforested', by which time the house had been demolished. The chapel remained as a chapel of ease for Aldborough Hatch, until St Peter's (below) replaced it in the 1860s. 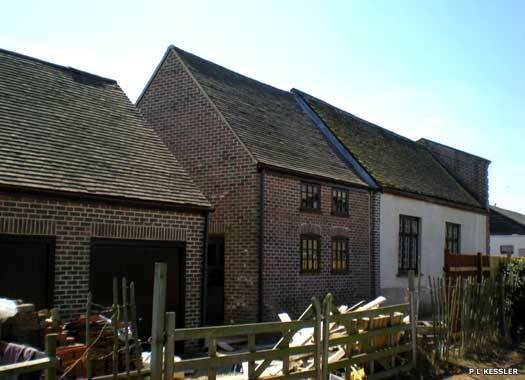 After that the chapel became an outbuilding of the local farm and in 2009 was converted into a private dwelling. St Peter's Church Aldborough Hatch is on the western side of Aldborough Road South, opposite Applegarth Drive. The church, which stands at the very edge of the Metropolitan Green Belt, was built in 1863 to meet the needs of a growing parish. It is one of six churches in the London area built in Portland stone taken from the demolished 1750 Westminster Bridge. 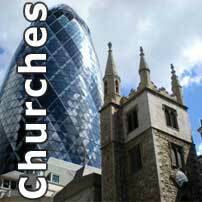 Soon after opening, a district chapelry, taken from the parish of Holy Trinity Barkingside, was formed. 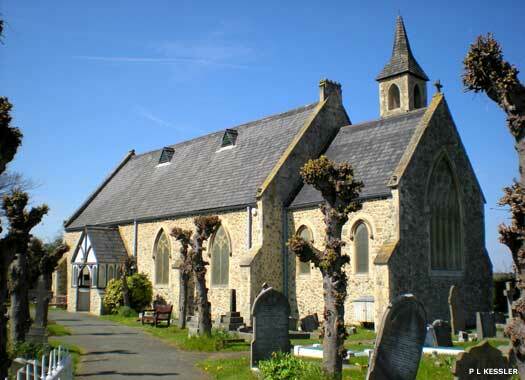 The church was designed by Arthur Ashpitel in the thirteenth century Early English style. 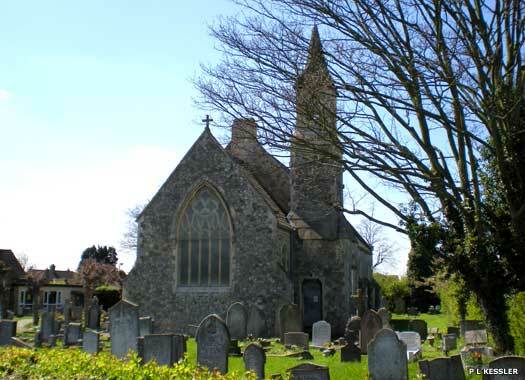 It stands in a graveyard and consists of nave, chancel, south porch and a small north-east bell turret. The church plate includes a cup, flagon, and alms dish dated to 1771, which came from the former chapel of Aldborough House (see above). In the graveyard is the burial site of a First World War flying officer, perhaps one of many, who flew from Hainault Airfield and died in 1917. 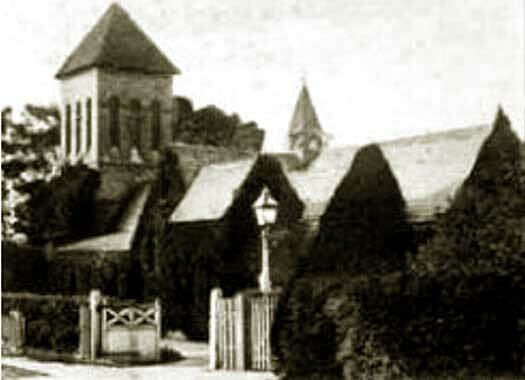 The Chapel of St James, Little Heath lay off Barley Road, close to Eastern Avenue. In 1862 Major G E Ibbetson built the unconsecrated brick chapel with stone dressings behind his Heath House residence for family and friends, but it attracted many others too. Ibbetson died in 1908 and the estate was bought by the County Borough of West Ham. The chapel was leased to the congregation and services continued until about 1930. In 1933 the building was demolished.